Additionally, a remote Hive metastore is required. Local or embedded mode is not supported. Presto does not use MapReduce and thus only requires HDFS. Cassandra 2.x is required. This connector is completely independent of the Hive connector and only requires an existing Cassandra installation. 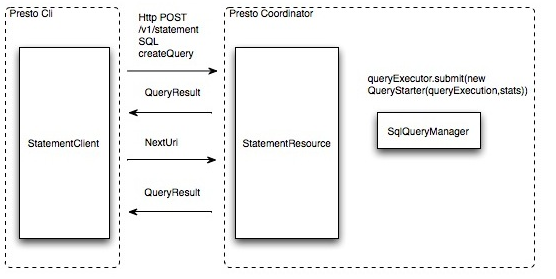 The TPC-H connector dynamically generates data that can be used for experiementing with and testing Presto. This connector has no external requirements. ./presto --server server1:9090 --catalog hive --schema default --execute "show tables;"
具体表现为：Query 20150507_013905_00017_3b8jn failed: Encountered too many errors talking to a worker node. The node may have crashed or be under too much load. This is probably a transient issue, so please retry your query in a few minutes. # The default level of all loggers. Can be OFF, ERROR, WARN, INFO, DEBUG, TRACE, or ALL. # The URL to the Presto coordinator. INFO  [2015-05-11 03:50:19,945] org.flywaydb.core.internal.command.DbMigrate: Successfully applied 5 migrations to schema `airpal` (execution time 00:01.568s).